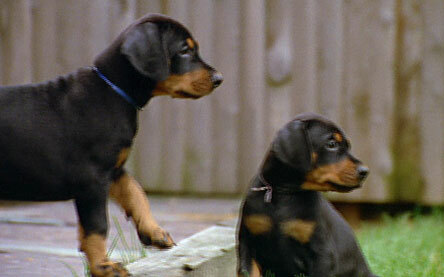 Dobermans are the result of a combination of a dozen different breeds -- they were bred to be alert, obedient, and aggressive. 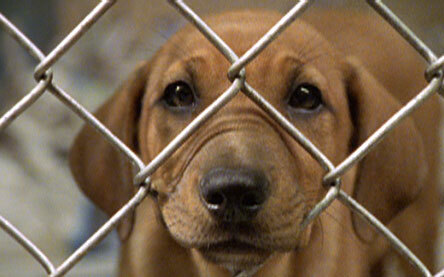 Adopting a puppy from a shelter is much less expensive than buying a pure-bred dog. It also saves lives: millions of dogs are euthanized each year when homes cannot be found for them. 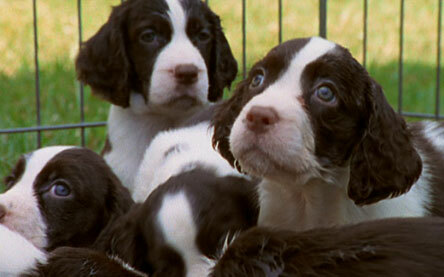 Most dogs have been bred by humans to perform specific tasks. 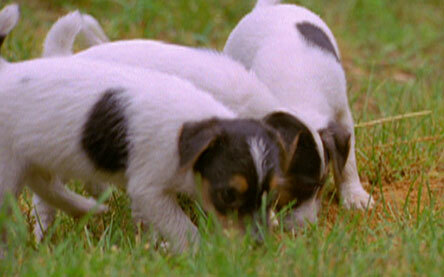 Terriers, for example, are determined diggers, bred to root out small animals from underground burrows. 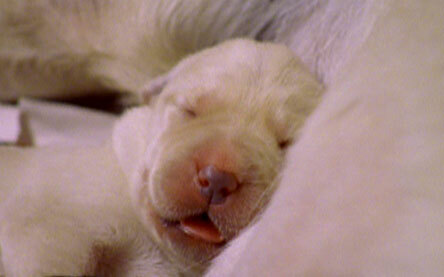 Puppies sleep ninety percent of the time, and shiver in their sleep as their nervous systems develop. 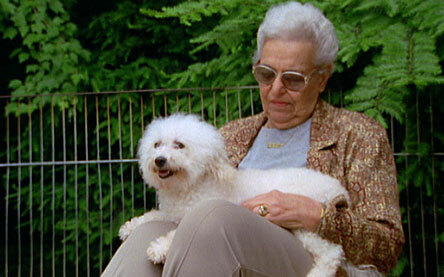 Calm, quiet dogs, bichon frisees were bred to sit on the laps of medieval courtiers, who believed lice and fleas would jump from them to the bichon's warm, hairy body. Beagles use their voices to communicate over large distances -- something prospective dog owners should keep in mind if they are looking for a quiet dog. Puppies huddle together for warmth as they feed from their mother. Born blind and deaf, they instinctively find their mother's teat. Training is easiest when a dog is young. 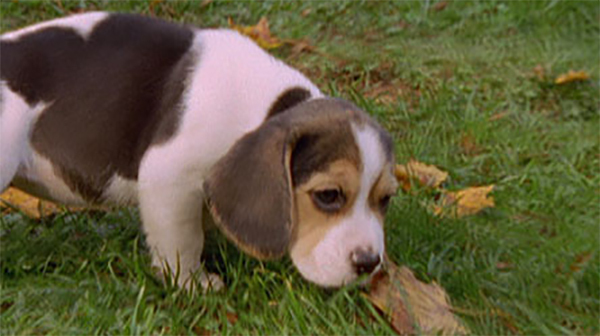 At six weeks, dogs are very open to new experiences. 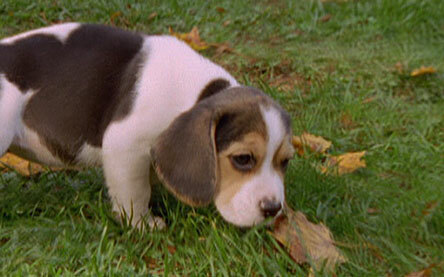 While it is hard to resist an adorable face, a puppy should never be chosen on the basis of looks alone. Numerous factors should be considered when buying or adopting a puppy, including temperament, personality, and the dog's size as an adult. 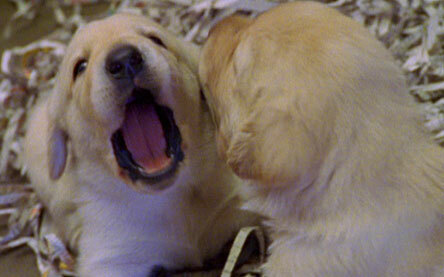 Golden retrievers are a good choice for guide dogs -- they are a large, good-natured, adaptable breed. Veterinary care is extremely important when adopting a puppy. In addition to shots, spaying and neutering is key to keeping the unwanted pet population down. Like their ancestor, the wolf, dogs are intensely social pack animals. 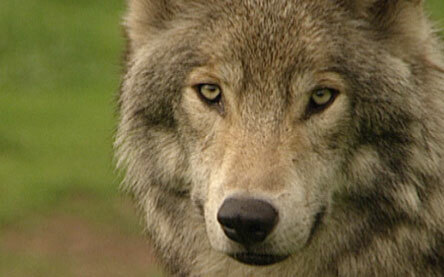 If fact, most dog behaviors can be understood by studying the behavior of wolves.